We are a group of people who enjoy making music together and want others to share this enjoyment, whether by playing with us or coming to our concerts. We are are basically a fiddle orchestra, but we include a few 'cellos and double basses. Our ages range from the teens to the eighties. There is a basic requirement to be able to read music and to play to a reasonable standard. We are always looking for new members. 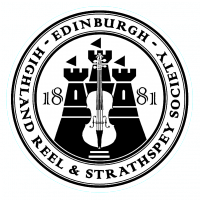 Our conductor and director of music is Yla Steven BEM, well known as a solo fiddler as well as for her work as conductor of the Lothian Schools Strathspey & Reel Society.